Global Advance is dedicated to reaching South Asia with the gospel. Recently, Pastor Ken Janke visited rural villages where we have trained pastors, drilled water wells, and planted churches. Church growth in rural villages in Pakistan has led to persecution of Christians. Alpha Relief steps in to support and care for the persecuted. From the dusty villages in the rural Sindh province to the urban push on the streets of Karachi Pakistan, Global Advance gathered Frontline Leaders to be trained to plant the church as a visible representation of the rulership, authority and kingdom of Christ in present day Pakistan. Read full blog here. Did you know that since the start of the conflict in Syria, the Christian population has diminished by half? But there is also good news rising from the ashes: those believers who have stayed are finding a richer, deeper faith, and a new passion for reaching their neighbors with the Gospel. 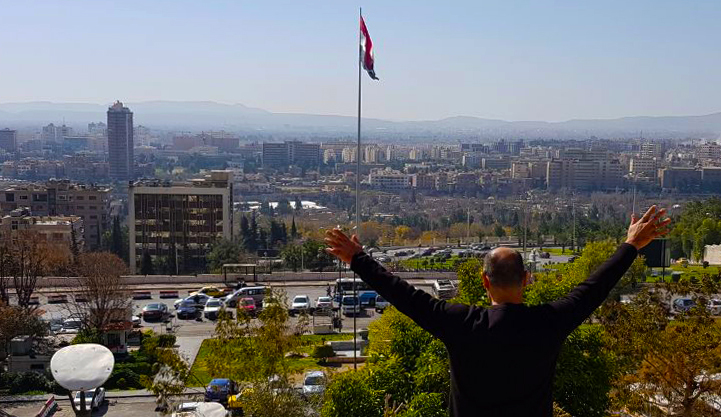 Alpha Relief Initiative Director Ben Gabriel sat down with Pastor George, a long-time frontline partner working to aid the Church in Syria, to help connect you with the reality on the ground. Listen in and gain an understanding of how you can pray and further support our brothers and sistersgoing forward so they can thrive. ON MISSION IN THE MARKETPLACE! God is raising up a multitude of Kingdom-minded business leaders and companies that have a Great Commission focus for their communities. Through your support, Global Advance empowered key entrepreneurs and professionals with Kingdom vision and principles in London, Germany, and Croatia in April alone! We are grateful for your partnership that fuels our Marketplace Missions training conferences and creates a launchpad for community transformation in key nations around the world. Check out this video from the Global Advance Marketplace Missions Conference in Zagreb, Croatia! David Shibley, Founder & World Representative of Global Advance, shares a message at Lakeshore Church In Rockwall TX. Scripture reminds us that we are more than conquerors through Christ. But it's difficult to live an overcoming life when we're constantly overwhelmed with attacks and setbacks. Find out in this series how to tap into Christ's resurrection power and rise above the stuff that's keeping you down. Recently, Global Advance spent a week in the Siberian region of Russia. Despite dangerous sub-zero temperatures, 450 passionate young leaders traveled to our NexGen Conference. God is raising up a new generation of young people who are on fire to fulfill the Great Commission! All this is happening with the backdrop of new anti-evangelism laws and increased regulations meant to hinder the spread of the Gospel. Pray for the next generation of Russian believers as they shape the future Church and take Christ to the marketplace, schools, and their families. Evangelical Christians remain a small percentage of the population, and many regions still have not received any witness of the Gospel. That is why for more than 20 years, Global Advance has worked with indigenous frontline leaders to bring the light of the Gospel to Russia and the former Soviet States. “Wishing that this season of Advent fills your heart and home with peace and happiness.” Together, with your support, and the guidance of our Lord, we were able to share the light of the gospel and the hope of the world in 40 nations this year. Your prayers, personal time and financial support have lifted up the hands of those on the frontlines that are shining His light into the darkness. We look forward to a blessed 2018 as we continue to stand in the gap for those who have yet to hear of His life-saving gift. Merry Christmas to you and your family from all of us at Global Advance! We are so thankful for our Ambassadors and International Coordinators that help to plan and lead our missions trips, our pastors and churches, and our financial partners that lift us up with monthly and major gifts, without you none of this would be possible. We also truly appreciate our prayer partners, we feel your love and support every day. Thank you for believing in us and what we are doing across the globe. Thank you for listening to the Holy Spirit when he speaks to your heart. We hope you have a blessed time as you gather in giving thanks. We are so thankful for your partnership and hope you have a wonderful and Happy Thanksgiving! When local missionaries ran into opposition from village elders, they reached out in compassion to provide what was needed most: clean water. Alpha Relief funded water wells in several strategic villages, and now small churches have been planted. There are many opportunities to continue advancing the gospel in rural Pakistan: local missionaries need transportation to oversee church plants effectively; solar-powered audio Bibles will help build a foundation in God’s Word, and dozens of villages still need access to clean water. Global Advance is committed to the fulfillment of the Great Commission in Pakistan, and you're invited to take part! We rejoice that you have partnered with us to serve the nations as a Global Ambassador. Each year when we plan and make commitments to equip leaders around the world, we count on our Global Ambassadors to go with us to train leaders in these nations. Your role in helping Global Advance empower frontline leaders is significant and appreciated! Dear Friends, Thank you for partnering with us and helping us to go to nations to equip frontline leaders to fulfill the Great Commission. The paradigm of God is multi-generational. From one generation to the next, we are to participate in the story of His glory. Global Advance has equipped and served Great Commission leaders around the world. We believe that God has uniquely fashioned the upcoming generation with gifts, talents, and abilities that the world needs. We are working to empower the next generation to fulfill the Great Commission, to strengthen the global Church, and to penetrate every sphere of culture with the gospel. And, we want to do this in a multi-generational way. I am so excited to share that through our NextGen Engagement Initiative, we have been able to empower over 7,600 young leaders. Among this group, 1,021 young leaders have committed to participating in mentoring relationships. In the last 8 months alone, 1,063 young leaders have committed to boldly declare the gospel. Global Advance is investing in up-and-coming leaders. We are also committed to helping the already established leaders to better engage with the next generation. Thank you for joining us in investing in these leaders. I am sharing a short video with you today to give you a glimpse of our recent NextGen event in Argentina. Let’s partner together so that future generations will know Christ and impact our world for His glory! In a dusty village in the rural backwater of a Central-Asian nation, a rooster crows. Five-year-old Amit stirs on his mat. Soon, he sits up and rubs the sleep from his eyes. The horizon is just beginning to glow a deep red. Thirsty, Amit stumbles over to a repurposed yellow, plastic gasoline canister and lifts the spout to his lips, drinking deeply. You might balk at the taste of earth and grass. It's still dark enough that you wouldn't cringe at the brown hue. But, Amit has never known anything different. He doesn't know that this water which quenches the night's thirst is what is making him sick. Later, his sister Neeti, who is twelve, will carry the plastic jug down to the canal. She will push aside the livestock and refill the container with the same mud-mixed dregs the goats are drinking. Neeti knows. A few more years of wisdom have taught her that it's not supposed to be this way. Thanks to Alpha Relief supporters, it won't be this way much longer. “It has been really painful to see what kind of water they are drinking.” — Pastor W. It's not hard to imagine kids like "Amit" and "Neeti", and see through the mind's eye how much a clean water source would improve their lives. Pastor W. has had a dream to do something about it for quite some time. He cares about the poor in his nation and cares that they have clean water to drink. But, even more so, he cares for their souls and wants to offer them the living water of the gospel. But some in the villages he's trying to reach see this as a threat, and they have set themselves against Pastor W. and his team. Enter, Global Advance’s Alpha Relief initiative. Through Alpha Relief, Global Advance empowers frontline leaders to advance the gospel in their communities, even amidst persecution. So quenching the physical thirst of rural villages is no less than the open door Pastor W. has been praying for. Through well-drilling, and the installation of pumps and filters, the hands-on love of Christ is shown. The opposition melts away. Thank you for your support which will supply clean water to rural villages as we watch Isaiah's prophecy come to life: "With joy, you will draw water from the wells of salvation." Isaiah 12:3. Crazy busy streets. Thousands of motorbikes cutting in every direction. Not an empty boulevard to be found. Cranes and shiny new towers arising everywhere casting shadows over the foulest of slums. Among the 15 million or so people in this city, there is one follower of Christ for every 50,000 persons. This is Saigon, Ho Chi Minh City, Vietnam. David Shibley, Founder and World Representative of Global Advance shares a brief message. We’re excited about our revamped training tools website 2tim2.org.